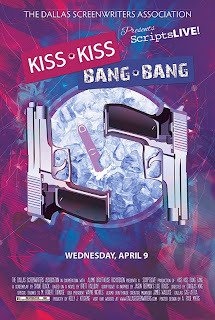 After a sold out performance of the inaugural ScriptsLIVE!, The Dallas Screenwriters Association (DSA) is returning to the Alamo Drafthouse Cinema – Richardson Wednesday, April 9 at 7 pm to showcase the classic Shane Black screenplay, KISS KISS BANG BANG. ScriptsLIVE! is a dramatic reading of a classic screenplay in front of a live audience. The actors, seated in director’s chairs, will present the material with a fresh read providing the audience with a new take of a popular film. Behind the cast of local actors will be projected establishing shots to set the scene. KISS KISS BANG BANG was written by Shane Black (who was one of the most highly paid screenwriters in the 1980s). 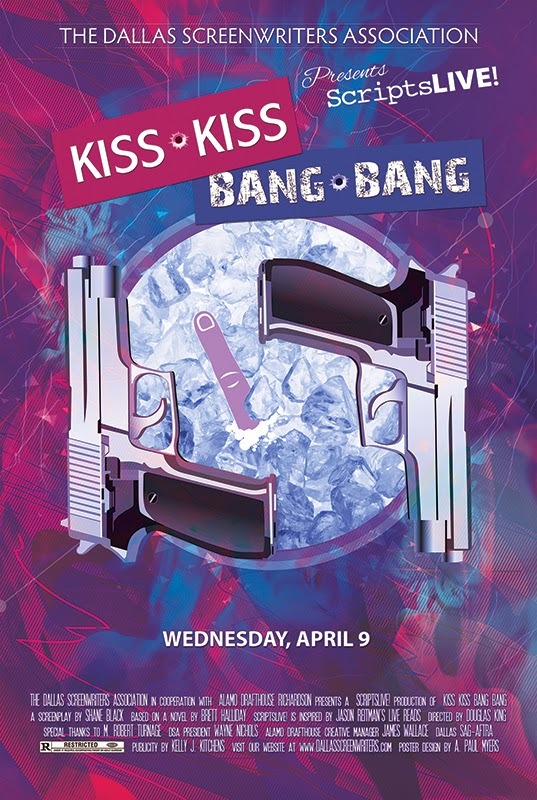 The script for KISS KISS BANG BANG is partially based on the Brett Halliday novel “Bodies Are Where You Find Them,” and interprets the classic hard-boiled literary genre in a tongue-in-cheek fashion. 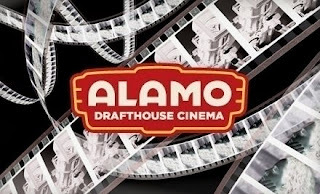 The film starred Robert Downey Jr, Val Kilmer and Michelle Mongahan, the film has become a cult favorite for film lovers. The entire cast is from Dallas/ Fort Worth. The role of Harry Lockhart will be read by Rich Levi (“Friday Night Lights,” “Walker, Texas Ranger,” ANY GIVEN SUNDAY), the character Gay Perry will be read by Steve Iwanski known for his stage work at the Mesquite Community Theatre (“Glass Menagerie,” “Lion in Winter,” “Greater Tuna”) and Kim Foster (THE SECTOR, EMMA, “The Good Guys”) will read the female lead Harmony Faith Lane. The supporting cast includes Tamara Voss and Nicole Hodges reading all of the female characters and Richard Houghton and Stanley Nwobi reading the male characters. New ScriptsLIVE! events will be held every other month, always on the second Wednesday of the month. Future screenplays may include TOY STORY 3, GROUNDHOG DAY, BACK TO THE FUTURE and more. The event is free to attend with a reservation.